Emerson’s Juan Carlos Bravo, a member of the metals and mining industry team, looks at the changing landscape of mining investments in Canada. Many investors are shifting their sights away from China due their slowing economy. Conversely, Chinese businesses are increasing their desire for overseas assets. This reflects a combination of abundant cash by the Chinese firms, and bargains as foreign asset prices remain depressed. It is no surprise that the oil & gas and mining industries top the list for China’s outbound mergers and acquisitions—according to numbers from Dealogic in a Wall Street Journal article, China’s Expanding Outbound Investment Appetite. 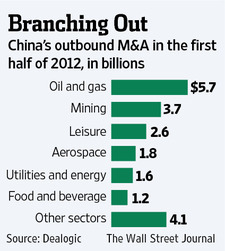 This reflects a strong appetite for energy and metals, where $9.4 billion in deals accounted for 45% of China’s outbound mergers and acquisitions (M&A) in the first half of the year. Last May, we blogged about how Chinese businesses were aggressively investing in mining in Latin America and Africa. As we can see, that trend continues but now with increased focus in Canada. 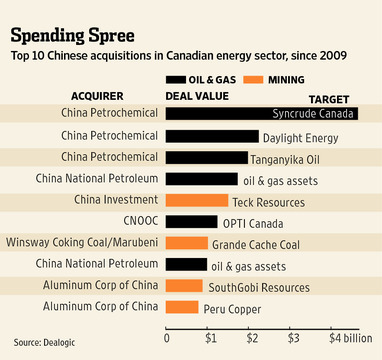 As recently reported in the Wall street Journal article, Inside Canada, China asserts itself, Chinese companies have spent around $23 billion buying Canadian-based resources companies since 2005, according to a Dealogic researcher. These acquisitions have entered the Canadian political fray. Native American groups exert significant influence over resource projects due to traditional claims to large tracts of Canadian territory, and Chinese investment groups are talking directly with several of these groups about investing in the tribes’ resource projects. What is happening now is that Chinese investments are raising greater visibility and governments are taking notice, and reacting with more laws and protection against them. In places from Australia to Mongolia, governments have increased their scrutiny of these investments. Canada has traditionally had an open policy with respect to investments in the past, but recently announced changes to its foreign investment laws. There are concerns among the Chinese investors about these proposals that may require additional disclosure and processes to follow. I believe that these investments overall are good news for the mining industry, but they can potentially hurt the industry in the long run through increased protectionism. This protectionism can increase the costs and timelines in developing a mine project with fees and requirements that can potentially make some of these projects not economically viable. Foreign investors need to balance their support for Native American groups and government officials. It is a fine line, but one they must walk, if they want their mining investments to succeed. This reinforces our conclusion from the previous blog post—Chinese businesses will become big players in mining in the not so distant future, but will have to work through the regulatory environment that goes along with it. Posted Monday, July 30th, 2012 under Metals, Mining, Minerals. for sharing information that is actually helpful. Good day!